One part of $2.9 million supports the University of Michigan Medical School for its Fast Forward Medical Innovation Program. The remaining gift of $1.45 million supports programs in the University of Michigan Office of Technology Transfer and Center of Entrepreneurship. These two grants will help create new commercialization education, training and mentoring opportunities for inventors and entrepreneurs. The Fast Forward Medical Innovation Program at the University of Michigan Medical School works to accelerate biomedical innovation and commercialization in diagnostics, therapeutics, devices, and healthcare IT. With the ultimate goal of improving patient health, researchers in this program support research at its inception, collaborate with commercial partners via novel methods, and enhance medical education by fostering innovation and entrepreneurship at all levels. The University of Michigan Medical School spends more than $450 million in research funding each year. In addition, the university has an ongoing funding challenge to drive technology commercialization based on ideas and expertise of its faculty researchers and physicians. Last year the University of Michigan researchers reported 400 new health-related discoveries with the potential to produce world-changing products, services, and companies. It is significant to assess and transform these early innovations into market opportunities and benefits for the general public. These two grants from the Davidson Foundation will provide resources to encourage, assess, and accelerate these promising innovations, which will help the effort to spur the creation of business and increase employment in the state of Michigan. The University of Michigan Medical School is eighth in the nation in terms of National Institutes of Health funding. The University received $412 million in 2013 and more than $186 million as of June 2014. The University of Michigan is currently involved in more than 400 clinical research trials ranging from new cancer medications to preventive health care. The North Campus Research Complex is the university’s newest hub for academic and private sector research with 30 buildings in 2 million square feet of sophisticated research space. The newest tools and accessible research services will help researchers at the University of Michigan, Ann Arbor campus to develop their highly specialized research projects. Laboratory supply companies can increase sales in the Michigan research marketplace by providing the best laboratory products and services to researchers at the University of Michigan. 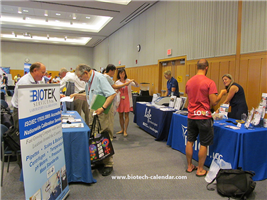 Biotechnology Calendar, Inc. is providing an opportunity for laboratory supply companies at the 14th Annual BioReseach Product Faire™ Event at the University of Michigan, Ann Arbor on July 24th 2014 to help lab suppliers network with the local research community. All were active research hands. Attendees came from 31 different research buildings and 71 on-campus departments. If you are a laboratory supply company interested in exhibiting at the BioReseach Product Faire™ Event at the University of Michigan, Ann Arbor on July 24th 2014, please click here for more information about the event. There are more events available at different institutions across the nation, please read the National Show Schedule for 2014.